The Customer Journey Study is a straightforward one. You ask your customers to go through your product and rate their satisfaction with every step. 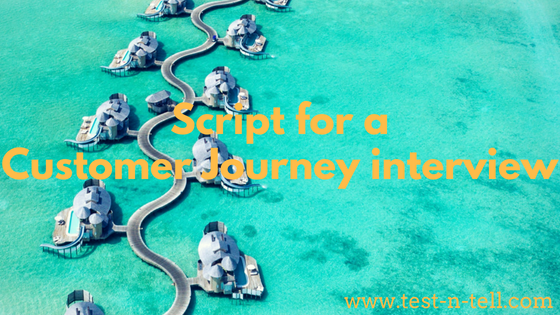 If you need a more detailed script - here it is. Provide a wider context. Be transparent. Tell what you want to achieve and why you need it. Don't forget to mention why your customer might want to participate. Favour, valuable incentive or potential product improvement are among the most popular reasons why your customer might want to help you. Send essential reminders, but only if you planned an interview well in advance. Send a quick "are we fine for today?" message on the day of the meeting. Be slightly ahead of time. Make sure you're ready for their arrival (physical or virtual). Put them at ease. Don't jump straight into the business. Make sure they're comfortable and relaxed before you start. Make sure they know it's a safe space. You don't evaluate them, not their skills nor their cleverness. All you need is to get honest feedback about your product. There are no wrong answers, no mistakes. Explain them once again what process you want them to cover. What steps they should perform and how you'd like them to give you feedback. Today I'll ask you to go through our reservation process. After each step of the process, I will ask you to rate it on the scale of 1 to 5, where 1 is a disguising experience, and 5 is a delightful one. Pro tip: ask them to think out loud while using your product. This might be the most valuable qualitative feedback you'd receive. Don't explain. You're not here to train them or justify your product. Don't talk about the future. Forget about "would you..." questions. Don't criticise. Never a customer, not even your product. If a customer says something is bad, agree and note it down. Don't talk too much. Your customer should do 80% of the talking. Ask why when appropriate. "Why" is your best friend during an interview. Guide a customer to the next step when inevitable. If your customer got stuck and can't continue, it fine to show the next step avoiding customer frustration. Be attentive and emotionally invested. Your customer should feel you care about the time and feedback they give you. Ask to perform an action with the clear goal. Example: search for a hotel in Tokyo for the next weekend. Ask how satisfying was this process. Ask why if you don't already have enough comments. Repeat for every step of your product or a chosen customer journey. Ask them for the overall remarks but not for the overall evaluation. Try to capture not only their logical reasoning but also an emotional reaction. Concluding a customer journey interview thank your customer and reiterate the importance of what they did for you. Tell them what would you do with the feedback they gave you. Discuss future touch points if applicable. Offer your help with whatever problems they might have with your product. You have your first customer journey map. Go send your next invitation.